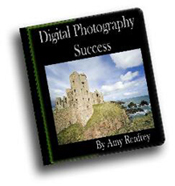 Thank you again for requesting your free copy of 18 Days To Better Digital Photos by Amy Renfrey. The download link is winging it's way to you right now by email. While you’re waiting for your free ebook, I’d like to tell you quickly about another ebook my friend Amy Renfrey has written. It's called Digital Photography Success. Finally, a digital photography book with beautiful photos and clear explanations that REALLY works when it comes to teaching YOU how to create stunning professional looking pictures. Click Here To Get Your Copy Now. She has written this excellent ebook for intermediate photographers, which helps them step-by-step to take their photography to the next level. It's over 175 pages and 11 chapters of pure digital photography basics, tips and techniques on how to take stunning photographs. Not only does the author Amy Renfrey show you exactly how to take the best photographs, she also explains to you how digital cameras work and the best digital camera to buy. Amy is a professional photographer and photography tutor, which makes her a very credible source on the subject. I also like the way she gives customers her email address and lets you contact her for unlimited help and personal support. Click here to learn more about Digital Photography Success now! She seems to genuinely want to help people improve their digital photography skills and isn't just concerned with selling her book.